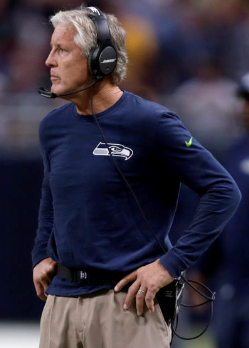 The Seahawks have been highly disappointing this season as the combined effects of a Super Bowl hangover (i.e., not fully trusting Pete Carroll anymore), contract squabbles and new additions have yielded the worst-case scenario: a 4-4 record. But, they won two straight before their bye and now have a chance to redeem themselves in the final eight games. Let’s take a look at each position to see how it has performed, what it needs to do better the rest of the year and what it might look like next year. Russell Wilson is completing a career-high 68.8 percent, but that has done nothing to help the offense in the red zone, where Seattle is the league’s worst offense. Wilson’s crew has been the main culprit in meltdown losses against Cincinnati and Carolina – games the Hawks should have won. Wilson is in his fourth season now and should be playing at a consistently high level, but he is not. Some of that is due to the subpar OL in front of him, some of it is due to the inconsistent play calls, some of it is due to him. Wilson needs to have more urgency. He needs to change plays more at the line. He needs to account for blitzers. He needs to move more to create better passing lanes. He needs to find his open receivers more quickly and get the ball out fast. The Hawks have little room for error in the second half, and Wilson needs to play like it. 2016: Wilson is signed for four more years and, despite the calls of some fans, he is not going anywhere. He and the entire offense need to find a rhythm and keep it – this year and beyond. Marshawn Lynch started very slowly and missed a couple of games, making plenty of us wonder whether he might be on the downward slope. He is averaging just 3.6 yards per carry, which would be the worst of his career. He has averaged under 3.5 in four of the six games he has played. He has only one 100-yard game, at San Francisco, and he had to fight and scratch for that. With this offensive line, speed to the hole is at a premium, which explains why Thomas Rawls is averaging 5.4 per carry and has one more yard than Lynch (376-375). 2016: After the season, Lynch will be on the Brett Favre Retirement Watch. The Seahawks have Rawls in reserve and can easily find another back, if necessary. The rest of the team would have to get over its devotion to Beast Mode and play football. That would be on Pete Carroll and his coaches to resolve. Tyler Lockett has been great when afforded the chance. Paul Richardson is about to get his. Jermaine Kearse has been all or nothing – five good games and three shutouts. Doug Baldwin has not been a very big factor in most games. Ricardo Lockette’s injury was unfortunate, mainly because of his special teams contributions, but it opens a spot for Richardson, who is a much better receiver. This group is really at the mercy of Darrell Bevell, Wilson and the offensive line. If those three elements start playing better, the receivers will have chances for plays. 2016: It’s easy to see Kearse moving on in 2016 – the Seahawks aren’t going to pay him much — and Baldwin might want to catch more passes elsewhere when he is done after 2016. Lockett and Richardson are the future. Jimmy Graham has been a huge topic of discussion, with most people deciding the Hawks have not used him enough and many claiming the trade to be a bust. Hardly. He is on pace to set team records for TEs, and Wilson has been looking for him more and more. In the second half, they should start hooking up in the red zone, too. And then everyone will wonder what all the fuss was about. Luke Willson took advantage of the focus on Graham and Lynch in Dallas, scoring the only touchdown. He’s a good role player who needs to continue to take advantage of his minimal opportunities. 2016: Graham is signed for two more years, at big numbers. The Seahawks obviously acquired him thinking he will be a big part of the offense going forward, and they surely will want to extend him in the next year. The question, as with most things: At what cost? A problem area for a decade, the line has hit a new low this year, thanks to the fact that the coaches decided to go with first-time starters at three spots. They have endured massive growing pains, but they also have shown some progress – they gave up no sacks vs. Dallas. It will never be pretty as long as they are stuck with these players, but it will get better. The rest of this season, they really need to get much better at blocking in the red zone. They have been destroyed there, losing almost every head-to-head battle in the scoring zone. They simply cannot run the ball when teams know the run is coming. Bevell needs to vary his play calling (not so much run-run-pass) to help the line. 2016: The question is whether Russell Okung and J.R. Sweezy have played well enough to earn new contracts – and whether Seattle can afford to keep Okung in particular. Mark Glowinski or someone else could replace Sweezy next year if Seattle can’t re-sign him for fairly cheap. At left tackle, Seattle would need to draft a replacement or sign a free agent to replace Okung. It’s easy to see a line of Alvin Bailey/TBA, Justin Britt, Drew Nowak/Kristjan Sokoli/TBA, Glowinski and Garry Gilliam next year. How much worse can it be? Cliff Avril and Michael Bennett have played as well as any linemen in the NFL this season – John Schneider’s moves to sign them in 2013 have proven to be among his very best deals. Bennett has 6.5 sacks and Avril has 3.5, but their contributions go way beyond those numbers. They should continue to lead the charge for a Seattle pass rush that ranks 10th in the league. 2016: After this season, this unit could be in for big changes. Will the Hawks do something with Bennett’s deal, even though he will have two years left? Brandon Mebane and Ahtyba Rubin have played well inside, but both will be UFAs after the season. The Hawks will need to keep at least one of them, if possible, and find a cheaper veteran run stopper as well. Rookie Frank Clark has not seen a lot of playing time, but he should figure heavily next season – likely as Bruce Irvin’s pass-rushing replacement. K.J. Wright has been playing the best football of his career, leading the team with 58 tackles. Bobby Wagner has 51 tackles. Irvin is second on the team with 4.5 sacks. 2016: Irvin will be a UFA next year and is not expected back. That means Kevin Pierre-Louis needs to prove in the second half that he can stay healthy. Richard Sherman has been consistently excellent all season. The rest of this group has been a mess. Earl Thomas finally seems to have regained his swagger. Kam Chancellor has had an up-and-down season since he decided to bless the Hawks with his presence in Week 3. Cary Williams has been a lightning rod for criticism, due mainly to a very rough game in Cincy and some inconsistent performances since then. Sherman has been shadowing the No. 1 receiver for the past few games, an indication that the coaches do not trust Williams to hold up on his own. 2016: The Seahawks have a lot of young corners, with Tye Smith, Marcus Burley and Jeremy Lane all back from injuries, and it will be interesting to see whether the Seahawks keep Williams at a $6.17 million cap number in 2016. Also of interest will be the team’s position on Chancellor, who will have two years left on the deal he clearly is not happy with. Will the Hawks make concessions for Bennett and Chancellor a year in advance? The kicking units have been excellent, with Steven Hauschka hitting 18 of 19 kicks and Jon Ryan averaging 47.3 per punt. 2016: Ryan will be a UFA next offseason, but the Hawks could keep him for $2 million a year.